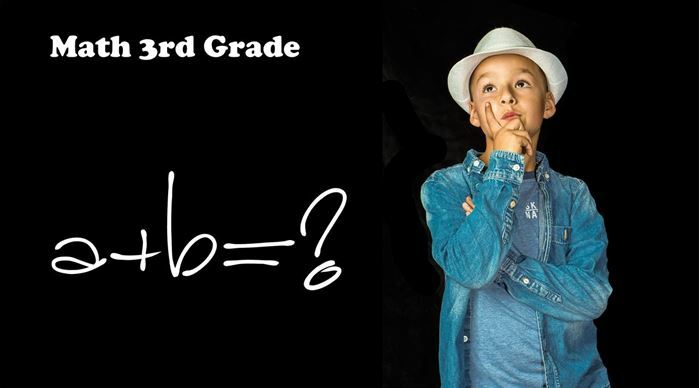 This course dives into the mathematics of the 3rd grade. The teacher of the course finds reasons to study each different area, making it easier for the students to motivate themselves to study. The different themes are gone through in a clear manner and many themes are given concrete examples easy to relate to. The course goes through the basics of multiplication and division, and the student will also understand regrouping when adding and subtracting numbers until 1000. This, of course, gives also the basis for more complicated addition and subtraction calculations. The student will also learn how to compare numbers with each other. A first peak into probability as well as patterns is also included. In addition, the student learns the basics of fractions and decimals, will understand about time and temperature, length and distance, perimeter and area, capacity and mass in both the customary units used in North America as well as the International, metric system. The course includes also basic calculations with money (U.S. dollars). In geometry, the course goes through different 2-D and 3-D shapes, as well as the coordinate grid and graphs, transformations and locations of objects. All in all, this is a good course for 3rd grade mathematics, giving a good basis to continue onto the 4th grade. This lesson goes through what the numbers from 1 to 100, what they mean, as well as some basic calculations. Mostly it is math that is needed already in the second grade, but this works as a good repetition of the second grade math before plunging into the content of the 3rd grade. The solutions for the tasks from this lesson. This lesson contains the basics of addition and subtraction with two digit numbers. The teacher goes through basic calculations with math blocks, number line and also goes through the basics of regrouping with two digit calculations. This lesson goes through what the numbers from 100 to 1000, what they mean, as well as some calculations. The student gets acquainted with three digits and understands the concept of hundreds, and how they relate to tens and ones. In this lesson, the teacher goes through the basic of comparison of numbers: the greater numbers, the lesser numbers, equal. The idea is to help students understand the values of numbers as well as how to compare them. This lesson contains the basics of addition and subtraction with three digit numbers. The teacher goes through basic calculations with math blocks, number line and also goes through the basics of regrouping with two digit calculations. This lesson handles how to regroup when doing additions with numbers from 100 to 1000. The rules of regrouping are the same however great the numbers are, and that is why this is one of the most important lessons in this course. This lesson teaches how to regroup when doing subtractions with numbers from 100 to 1000. The rules of regrouping are the same however great the numbers are, and that is why this is one of the most important lessons in this course. This lesson goes through the basics of multiplication. Multiplication is related it to addition, and the student understands fundamentally and in a concrete way, what multiplication means. This lesson continues work with multiplication. It also introduces some rules and hints how to calculate some multiplication tables faster in one’s head. This lesson goes through the basics of division. Division is related it to multiplication, and the student understands fundamentally and in a concrete way, what division means. This lesson continues to dive into the secrets of division. It relates it further to multiplication as well as introduces the vocabulary of division. In mathematics, the calculations are done in a certain order. The order is very important and fundamental, since it affects the outcome of each calculation. In this lesson, we go through the order of operations and the rules needed in 3rd grade math. This lesson introduces the concepts of length and distance. It includes lots of measuring and estimating, as well as the basic units used to measure length and distance. This lesson introduces the concepts of perimeter and area. The student will understand, how different shapes affect the perimeter, and how perimeter and area relate. Measuring perimeter happens in this lesson in “units” and measuring area in “unit squares”. This lesson introduces the concepts of capacity and mass. It includes lots of measuring and estimating, as well as the basic units used to measure capacity and mass. This lesson introduces the concepts of time and temperature. The student learns how to measure time with an analog clock that has minutes and hours. Temperature is introduced through a thermometer. The international measurement system is something that is very good to be aware of. This lesson introduces the metric system to students and compares it with the customary system used in North America. This lesson goes through U.S. bills and coins and helps the student to get familiar with money, and recognize the value of different bills and coins. This lesson concentrates on doing calculations with money. It is an important skill in every day life. It also introduces calculations with cents. NOTE: Before this lesson it is important to go through the Decimal lesson. This lesson introduces different quadrilateral shapes and what their properties are. After this lesson, the student can recognize several quadrilateral shapes, as well as define them. This lesson continues work with two dimensional shapes. It introduces triangles and their properties, as well as other two dimensional shapes. This lesson introduces three dimensional shapes, the vocabulary related to them, as well as their properties. Some of the shapes are also drawn in the lesson. This lesson introduces graphs. Graphs are a visual way to compare numbers, and it helps especially when there are more numbers to compare. The student will learn how to interpret as well as draw bar graphs. This lesson introduces the coordinate grid. The coordinate grid is an important concept that is needed often later in math. The student learns about the x- and y-axis, as well as the recognize locations of shapes and objects. This lesson introduces the transformations of different shapes. Slides, flips and rotations in mathematics are different ways of working with different shapes, and the student becomes familiar with all of them. This lesson introduces fractions in many ways, to give the student a concrete idea what fractions mean and how to recognize fractions, as well as how to compare them. This lesson introduces decimals. Decimals are needed in many things, from interpreting sport results to calculating with money. In this lesson, decimals are also related to fractions and the place values of decimals are explained. This lesson introduces patterns in shapes to students. The student learns to recognize continuous patterns that are presented as shapes. This lesson is fun detective work! This lesson continues the work with patterns. The student becomes familiar with patterns in numbers and gets to do lot of fun detective work yet again! The student also becomes familiar with the concept of even and odd numbers. Probability is an important concept in math as well as science. This lesson introduces the basics – how to describe probabilities as well as tell probabilities as fractions. This video-course is primarily intended for third-graders. Students taking this course will need to have completed 2nd grade mathematics. Jori Pitkänen is a Finnish teacher who has a Master’s degree in Education. He specializes in teaching the 1st to 6th grade classes. He is enthusiastic in teaching mathematics and tries to find the reason to study each area in mathematics instead of just teaching. He is interested in his students’ motivation and explains things in an understandable way. In his professional life, apart from teaching, he teaches teaching methods (drama in education and gamified education) to teachers, coaches the unemployed and does theatre professionally, especially Playback Theatre. He is an enthusiastic student of learning and is interested in how learning happens and what makes it easier for students to learn.